The deal today over at Baby Steals is Burp Armor Organic Burp Cloths/Bibs for $13.50 or 50% off! “Once upon a sleepless night a new dad had an idea. The inspiration was simple: design a plush, absorbent burp cloth that is all natural, soft, ergonomic, and most importantly, has enough traction to stay put. As parents to two young children, the owners of Burp Armor knew about the messiness of burping (they’ve both lost many shirts to the spit-up, vomit, dribbles and drools), and that’s what inspired Mike to invent a burp cloth that would simply stay on his shoulder. “Made in the USA from 45% organic cotton and 55% sustainable hemp, Burp Armor burp cloths are prewashed in organic soap and emulate the soft, plush absorbency of cloth diapers. Valid today, 10/29 only, while supplies last. TODAY ONLY: Baby Sherpa Diaper Bag Backpacks 52% off! The deal today over at Green Baby Bargains is 52% off Baby Sherpa Diaper Bag Backpacks. Offering Baby Sherpa, Alpha Sherpa and Short Haul Sherpa with prices starting at $40.80. I love that most of these offer an integrated cooler compartment to keep food and bottles cold! drink holders, pacy & toy clips and so much more. I have seriously been coveting these diaper bags for a long time! Valid today, 10/25 only, while supplies last. I had already been cloth diapering #1 for a year and a half before a friend told me about an actual brick & mortar store about an hour from my home. This friend was due to have a baby in a few months and had been considering cloth diapers. But she wanted to actually hold some in her hands before she made a decision. She had been one of our weekly sitters for #1 and was familiar with what we used, but just wanted to see what else was out there. So, enter Cutie Poops & Bottoms of Orland Park IL. My friend and I knew nothing of what to expect when driving to the store. It is located in a shopping strip mall and using the directions on the website, very easy to find. From the outside, looks like a children’s specialty shop. We were greeted right away and almost immediately began a discussion of baby carriers, because I was wearing #2 (who was only 2 weeks old) in a Moby Wrap. This was back in April and the store was going to start carrying different carriers and having classes. (See products and services sections below). Although we didn’t realize it right away, we were speaking with the owner, Sherri. And, goodness, did she know her stuff! Discovered she is the mother of twin boys – 100% cloth diapered from birth! She gave a short demo of the various CD’ing options for my friend (who was so excited she was able to actually touch the diapers!) And it was nice for me to be able to see in person a lot of the diapers I’d only seen online (Happy Heinys, GroVia, etc.). As Sherri finished answering my friend’s questions, I wandered to see what else the store carried. I was in the market at the time for some wool or fleece covers, plus searching for some diapers that would fit #1 – who was outgrowing everything we had! The products carried in-store are a great sampling. diaper bags, nursery furniture, and more! A lot of WAHM stuff as well. And her website has a TON of stuff, also! More than what is in the store. Although, in-store has some different products also, including local WAHM products. Although my friend didn’t buy anything that day (but DID set up a baby shower registry), I walked out of there with a KiwiPie one-size fitted diaper to try with #1, an AhGoo Baby Plush changing pad, a Happy Heiny trainer, and a tub of Earth Mama Angel Baby Bottom Balm. Cloth Diaper Trials – These are great programs if you’re not sure you want to actually go with cloth, but want to try it out. Pay a deposit, get a sampling shipped to you, use the diapers for a set amount of time, mail back the diapers and get a refund (minus a set up fee). If you like it, purchase the ones you want. Easy as pie. Fluff of the Month Club – Ok, this is really for us CD addicts out there. 🙂 Buy a membership (varying lengths offered) and every month you get a new diaper shipped to you! Diaper Packages & Starter Kits – everything bundled together! Gently Used Program – buy and sell your used diapers. Great way to save money (and earn money!) when you’re starting out! Gift Registry – having a baby? Register for gear, diaper, and accessories! Special Events – she recently had a Buy, Sell, Swap event. I was so bummed I couldn’t make it! In general, the customer service Sherri offers is outstanding. She knows her products, her vendors, and she knows what works and what doesn’t. If she for some reason doesn’t know an answer, she will find out for you. My friend had a slight issue with some of her registry items shipping from the warehouse, but Sherri was good at explaining what was going on. My friend did have to ask for an update once, but seemed overall satisfied. I have not had to make any returns or had any issues with products, so I cannot speak on that point. However, I have had many conversations with Sherri, both by email and on Facebook, and she is always prompt and courteous. The website is very clear, with minimal items on the homepage (great! I hate the clutter on some sites!). Products are divided into sections For Baby, For Mama, Baby Gear, Cloth Diapers, For the Nursery, as well as a photo gallery. The class listing is posted, with information on how to register. There are also a couple of helpful articles: FAQs, Diaper 101 and Why Choose Cloth that are really helpful. Everything can be purchased online and shipped to your home, which means the store is accessible to anyone! Not just those in the Orland Park area. Which I love, because I don’t get down there often. But this is great, too, for all of you no where near Chicago. You can participate in any of the sales, promos, clubs, trial programs, right through the website. Obviously, the special events and classes are for local residents who can come by the brick&mortar store. Overall, I really like Cutie Poops & Bottoms. Because I try to support local businesses first, CP&B is one of the first I check when I’m looking for new items. I like that I’m dealing with a business that is giving back to the community with education classes and support, instead of just an online store. Although it is not the only store in my area, it is one of the few with an actual storefront that I can send people to. So, if you’re ever in the Orland Park area, stop by and tell Sherri you found out about them on Green & Frugal Mama! I bought one of these from a cloth diaper store near me just after #2 was born (shout out to Cutie Poops & Bottoms in Orland Park IL!) and we absolutely LOVE it. May have to write up a completely separate review for it, now that I think about it. Anywho- we use it when traveling, makes a great soft service in the back of the Hyundai Santa Fe for changing, but we’ve also used it in the bedroom at night for those 3am changes. So, this is a great chance to pick one up for a great price. Valid today, 10/1 only, while supplies last! Earth’s Best is “offering parents the chance to host their very own Earth’s Best Playdate Party! Each Playdate Party comes complete with an Earth’s Best Party Pack, containing over $90 worth of products for the host and their guests to enjoy.” Check out their Facebook page to find out how to enter. My Baby’s Green 50% off item for today is the adorable Garden Tote by Under the Nile. Pick one up for $12.48! Valid today, 8/23 only! EcoMom’s Daily Deal today is Doctor T’s Supergoop! Bundle: 1 Medium Super-Pump (24oz) and 1 pack of Super-Swipes for $61.20! Original price $105! Valid today, 8/23 only! Order something from Country Drawers’ new store between today and Friday (8/27) and be entered to win a diaper sprayer OR a $30 gift certificate to the store! And rumor has it, their school bus legs are back in stock! Bebe Au Lait nursing covers are 50% off over at Baby Steals TODAY ONLY! Snag one for just $19.99. Cutie Poops & Bottoms has announced their own Fluff of the Month Club! Like other store’s similar programs, subscribe and every month you get a surprise delivery of new diapers. They are offering varying lengths for subscriptions, from 4months to 9 months and you can opt to pay the membership subscription fee all at once, or monthly. Rate is $22.50/month. Sherri says “We want to make it fun! In our Fluff of the Month Club, you will receive many adorable prints and unique diapers that I have either commissioned for our store, or something great I found from a WAHM (work at home mom). Here are some examples of diapers you just might get including exclusive prints, tie-dye, camouflage, and sports. Remember: half the fun is the surprise! You might also receive brand new colors or prints from our already popular brands including bumGenius, Fuzzibunz, GroVia, Thirsties, Bummis , and more. 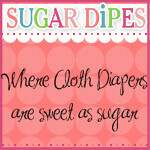 Other diapers may include WeeHuggers, Lollidoo’s, Butterbears, Forward Thinking, Kiwi Pie, and more. Possible diapers include: Thirsties Duo-Diaper, bumGenius Elemental AIO, GroVia AI2, Bummis Bamboozle, Flip Stay Dry or Organic, Tots Bots Easy Fit, and more!” YOu can also indicate your preference to AIO/Pockets or Wraps/Covers and if you want Boy, Girl or Gender Neutral colors/prints. Check out her store site to find out more information. These are all from posts from my favorite stores and products on Facebook. Have you “liked” your favorites yet? Great deals can be had…. EcoBabyBuys has a set of 4 cups & bowls from Kinderville for $17.99 – 40% off! These are made from “high-quality, food-grade silicone and are thoroughly safety-tested: BPA-, Phtalate-, Nistrosamines- and Lead-free.” Valid today, 8/16 only, while supplies last. If you’re in the Chicago area, Cutie Poops & Bottoms cloth diaper store in Orland Park is having a Belly Masking event on Saturday, August 21st. See their website for more details. Zulily has a couple of events going on right now that look great. This is a member-only site, but it’s free to sign up. Kiwi Industries ends 8/19 at 7a PDT. – organic kids clothing like this adorable jumper at $11.99 – regular price $24! Zid Zid Kids ends 8/19 at 7a PDT. – Handmade kids toys & playthings. “By blending together old and new artistic influences alike, Zid Zid Kids aim is to bring you and your child designs that surprise, inspire, and will be treasured for years to come.” This adorable hippo is $14.99 – regular price $36. FREE Little Beetle Wool Wetbag with the purchase of a Little Beetle Fitted, Little Beetle Wool Cover, or Little Beetle Learners. Totsy has LilleBaby sales event that ends 8/19. “líllébaby totes, carriers and diaper bags are designed to fit the American parent’s lifestyle, marrying stylish Scandinavian design with easy-to-use American functionality and safety requirements.” While still pricey, these are good deals on some quality carriers, etc. Like this Everywear Style – Multiposition Carrier for $70 (regular price $100). Totsy is a member-only site, but it’s free to sign up. My Little Green Shop is having 50-70% off select organic and eco-friendly items until the end of August. This is a great Canadian store based out of Vancouver that I stumbled on while doing the Green Quiz Quest. One of the items included in the sale is this adorable Bossy Baby Hankie Purse 70% off for $10.80 (CAD). These are made from vintage hankies and ribbons. Great upcycling! 🙂 And the shop donates a percentage of all proceeds to charity! Baby Half Off has Sesame Street reusable bags from Envirosax 50% off – starting at $10 for a set of 2! Super excited about these. I grew up on Sesame Street and absolutely LOVE Oscar the Grouch. Valid today, 8/16 only, while supplies last. These bags are super strong, hold up to 44 lbs. Washable, won’t fade. AND they roll up and snap into a super-awesome little package. Great for the diaper bag or purse. For those who love their Moby Wraps, they are offering a Photo Contest right now to win a FREE Wrap. Just send them your best vacation photo of your little one in a Moby. Entries must be received by 9/5 at 11:59p PST. Be sure to check out past Green Baby Deals posts! Don’t want you to miss out on anything! Also, all Giveaways will now be under a separate post. Enjoy! Ok, let’s get some deals going! Giggle Britches is offering 20% off all Rump-a-rooz pocket diapers until 8/12 at midnight. Also, these qualify for FREE shipping! 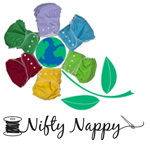 EcoBabyBuys has Bitzy-Bamboo Burp Cloths & Wash Cloths for $9 – 55% off. “Eco-friendly and chic, these burp & wash cloths are made from baby bamboo and accented with a splash of designer fabrics! They are the perfect size and weight to throw in your diaper bag as burp cloths, wash cloths or mini-blankies. The bamboo fabric looks and feels like silk, but it is much more practical as it is machine washable! Bitzy Burpers utilize remnant fabric that would otherwise go to waste – yet another way to reduce, reuse, recycle & go green! Sold in sets of two 8″ x 14″ burp cloths bundled up with Itzy Ritzy ribbon – these make the perfect gift!” Valid today, 8/11 only, while supplies last. BabyHalfOff is offering the Bumkins Deluxe Diaper Bag at 50% off – only $34.97! “The Deluxe Diaper Bag is both funtionable and fashionable and features bold and graphic prints. With a total of nine pockets, adjustable straps and waterproof fabric, this practical bag is the ultimate choice for lasting, fashionable quality.” Valid today, 8/11 only, while supplies last. Fluff Envy has the New Rumparooz prints open for preorder. Use promo code: MOTHER050610 and get 10% off! PlumOrganics baby food is on sale over at Amazon.com! Get a 24-pack of pumpkin and banana for $25.78 with Subscribe & Save. (Subscribe & Save can be cancelled at any time!) That works out to $1.08/pouch. Not the best price I’ve ever seen for PO, but not bad. Check out this great post over on Organic Deals & Coupons about stacking coupon codes at Amazon to get GREAT deals on diapers. ShooFoo leather baby shoes. Ends 8/16 at 7a PDT. “Precious first steps! ShooFoo’s soft sole shoes and tennis shoes help little ones stay steady as they walk. Super-soft, durable leather shoes with suede soles are perfect for pre-walkers, too. They come with fun graphics, like bulldozers, trains, butterflies, and bunnies. ShooFoo’s sporty rubber-soled tennis shoes naturally flex to develop strong feet, excellent balance, and good posture.” Loving these new Halloween styles! Be sure to visit EcoMom about 10:30a PST for their Daily Deal! These sell out fast.